At Nottingham Driving we have a whole fleet of big boys toys. 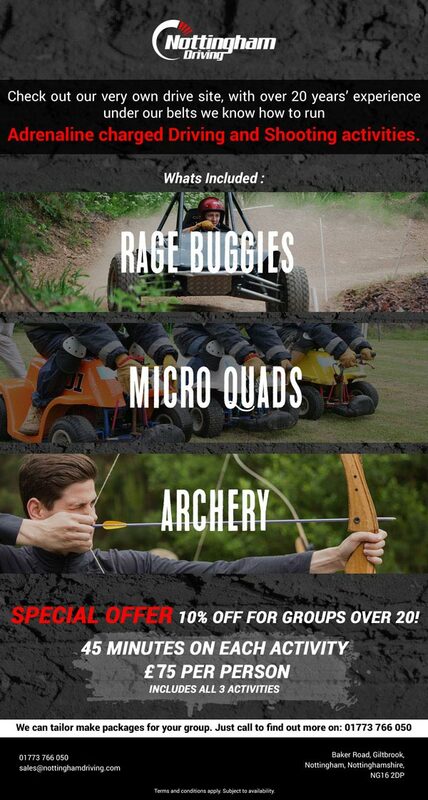 Get your team to try their hand at classic driving activities such as 4x4 Driving, Rage Buggies and Powerturns. We have a number of badass buggies that are quick off the mark, super responsive and corner brilliantly. Our in house corporate events team will work with you to design and deliver a package that engages, inspires, motivates and entertains your delegates. T&C'S apply: Subject to availability. Cannot be used in conjunction with any other offers. Weekdays only. Site can only be opened during daylight hours. f you wish to receive any more information on the above please contact us for more information.